I’m not sure of the origins of this recipe, but it’s been a Sunday night staple in our family for many years. My husband’s mother also made it, although her version left out the rice and added carrots. I still make it, but add in soy or teriyaki sauce. I think it’s one of those recipes that enable you to use up whatever vegies are left in the fridge – tasty and versatile. Cook the mince steak in butter until brown, then add the onion & celery and cook until soft. Add the soup, curry, rice and salt and pepper, then lastly the cabbage. Cook for about 30 mins until the cabbage is cooked – mixed all together. ***You can add extra vegetables & soy or teriyaki sauce to taste. 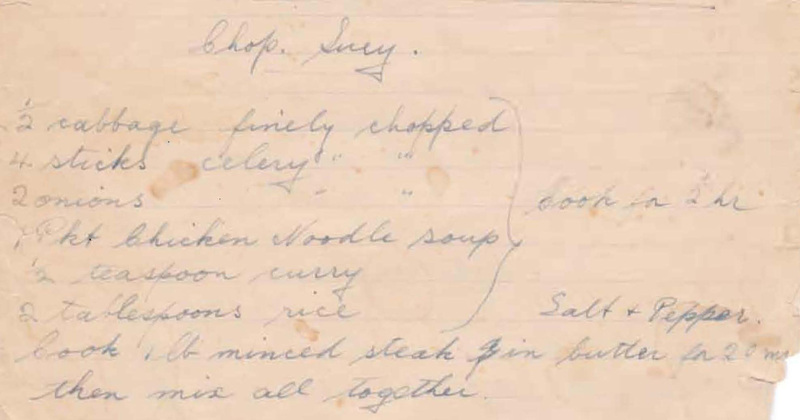 This entry was posted in All Recipes, Beef, Main Dishes and tagged 1950s, cabbage, chicken noodle soup, chop suey, mince steak by bebsrecipes. Bookmark the permalink.